A tractor trailer accident can happen at any time on almost any Delaware roadway, highway or interstate. Since tractor trailers, commercial vehicles and corporate delivery vehicles provide goods and services throughout the State of Delaware you must share the road with them. A Delaware trucking accident can inflict very severe and sometimes fatal injuries if it crashes into an automobile. Once a Delaware trucking accident happens, it is extremely important that any and all liable parties or entities are established. If you, a loved one or family member have been hurt, injured or killed in a Delaware trucking accident, please call The Freibott Law Firm at (302) 633-9000 in New Castle County and Kent County, Delaware. If your accident was in Sussex County, Delaware please call (302) 227-9559. With more than 25 years of experience handling tractor trailer liability cases in Delaware, Mr. Freibott will get you the maximum amount of compensation to which you are entitled. Delaware Automotive Accident Liability Lawyer Frederick S. Freibott offers free consultations to tractor trailer accident victims and their families. Mr. Freibott charges nothing unless he recovers on your behalf. Call The Freibott Law Firm today to schedule a free consultation. Liability in a trucking accident or tractor trailer accident is slightly different than a regular car vs. car auto accident. In an automobile accident occurring in Delaware, more often than not, the liable party is the other driver and their insurance company. In a Delaware Delivery Vehicle Accident there can be multiple parties responsible from a legal standpoint. Since tractor trailers, commercial vehicles and delivery vehicles are typically corporate owned, the owner of the company and their insurance carriers can be legally responsible for your injuries and damages. As tractor trailers are often maintained by a third party maintenance company, that organization may be liable if it is revealed that negligent maintenance practices caused the accident. If the accident was due to a defective truck part or defective truck product, the manufacturer, and any other entities in the chain of commerce, may be held liable for injuries you suffered in the accident. Since uncovering liability in a Delaware Corporate Trucking Crash can be incredibly complex, it is imperative that you retain an experienced Delaware trucking accident liability attorney. This will offer you confidence, knowing that any and all means of compensation will be obtained for you. 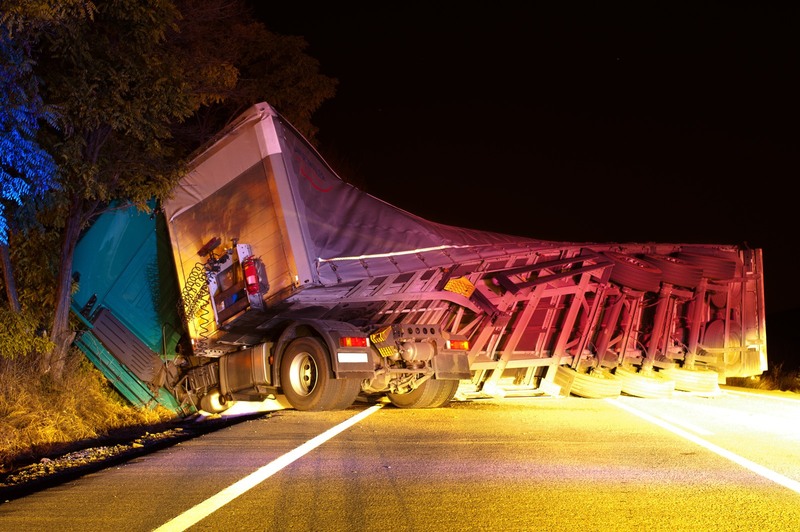 Following a tractor trailer accident your life may not be the same depending on the severity of the trucking accident. You and your family will face issues concerning growing medical bills, lost income/missed work time and automobile replacement costs. You could also very well experience severe physical discomfort, extensive recuperation time, rehabilitation efforts and emotional trauma. All of these issues, as well as others, can upset the balance and financial stability you and your family enjoyed prior to the accident. By having a qualified Delaware Trucking Accident Lawyer you can focus on recovering while they focus on all legal and administrative issues regarding your Delaware Truck Accident Lawsuit. It is in your best interest to consult with and retain a skilled Delaware Truck Accident Liability Attorney immediately after your accident. The Delaware Government Vehicle Accident Liability Lawyers at The Freibott Law Firm will work on your behalf and fight aggressively for your legal rights during this difficult time. Also, they will strive to get you the maximum amount of compensation for your injuries, medical expenses and lost wages. Call The Freibott Law Firm at (302) 633-9000 in New Castle County, Delaware or Kent County, Delaware. If your tractor trailer crash took place in Sussex County please dial (302) 227-9559 to discuss your Delaware 18-Wheeler Injury Liability claim. Delaware workers who are injured on the job have a right in law to pursue workers' compensation benefits. These kind of benefits cover the buying price of medical care and lost wages. Workers’ payment is a form of insurance plan providing wage substitute and medical benefits in order to employees injured throughout employment in exchange intended for mandatory relinquishment of the employee’s right to file suit his or her employer to the tort of neglect. While various programs differ, provision could be made for weekly bills in place of wages, reimbursement for past and also future economic reduction, reimbursement or repayment of medical and including expenses, and positive aspects payable to the household of workers wiped out during employment. The idea for workers’ pay out insurance is that the loss suffered by a staff due to an commercial injury should be borne directly by the sector in which the employee has been hired and ultimately by the general public. So, workers’ compensation can be a “no fault” method and an hurt employee need not create that his employer was negligent to be able to receive a compensation award. Suffering a serious injuries can be a difficult practical experience for injury victims and their families. Based on the extent and extent of a person’s damage, he or she may need to seek costly medical treatment as a way to recover from his or her accidents or at least stabilize the actual individual’s health. It may also be necessary to miss considerable amounts of perform while recovering from often the injury, leading to any loss of wages that can put the person in a very stressful financial situation. You may assume inappropriately that there is nothing you can perform to improve your situation or even better your statements post-accident. That is not really true. Consult with any Delaware auto accident law firm immediately. It is a smart idea to request an initial discussion with one or more Wilmington DE car accident legal professionals as soon after your own wreck as possible. It is best to do this only following appropriate medical treatment is obtained and concluded. Our lawyers can help you understand your privileges and options, as well as how to best protect your own personal legal interests post-accident. Mishaps happen, of course , and some injuries are simply inevitable. However , in many cases, typically the negligence or rashness, irresponsibility of others will cause an otherwise preventable problems for occur. In these scenarios, injury victims may have a right to practice compensation from the individual or party in the wrong. If you have suffered an overuse injury caused by someone else, often the legal team in the Freibott Law Firm can help you seek justice along with secure the full monetary compensation you should have. Accidents happen, of course , and several injuries are simply necessary. However , in many cases, the negligence or recklessness of others will cause an otherwise preventable injury to occur. In these conditions, injury victims could possibly have a right to follow compensation from the man or woman or party responsible. If you have suffered a personal injury caused by someone else, the legal team within the Freibott Law Firm will let you seek justice in addition to secure the full economical compensation you are worthy of. Suffering a serious injuries can be a difficult expertise for injury affected individuals and their families. Depending on the extent and seriousness of a person’s damage, he or she may need to find costly medical treatment so that you can recover from his or her accidents or at least stabilize the particular individual’s health. It can also be necessary to neglect considerable amounts of job while recovering from typically the injury, leading to the loss of wages that can put the person in a stressful financial situation. Delaware workers who are damaged on the job have a right in law to pursue workers' compensation benefits. These benefits cover the cost of medical care and lost wages. Workers’ settlement is a form of insurance policies providing wage substitution and medical benefits to help employees injured during employment in exchange for mandatory relinquishment from the employee’s right to file suit his or her employer for that tort of carelessness. While various ideas differ, provision can be made for weekly obligations in place of wages, payment for past in addition to future economic loss, reimbursement or transaction of medical and like expenses, and advantages payable to the household of workers slain during employment. The theory for workers’ settlement insurance is that the burning suffered by staff due to an industrial injury should be maximum directly by the marketplace in which the employee seemed to be hired and ultimately by the general public. Therefore, workers’ compensation can be a “no fault” process and an hurt employee need not create that his employer was negligent as a way to receive a compensation prize. You may assume incorrectly that there is nothing that can be done to improve your situation or perhaps better your says post-accident. That is not really true. Consult with a new Delaware auto accident lawyer immediately. It is best if you request an initial assessment with one or more Wilmington DE car accident legal professionals as soon after your personal wreck as possible. You ought to do this only immediately after appropriate medical treatment is definitely obtained and done. Our lawyers can assist you understand your protection under the law and options, and the way to best protect your personal legal interests post-accident.